Hooray for the weekend! 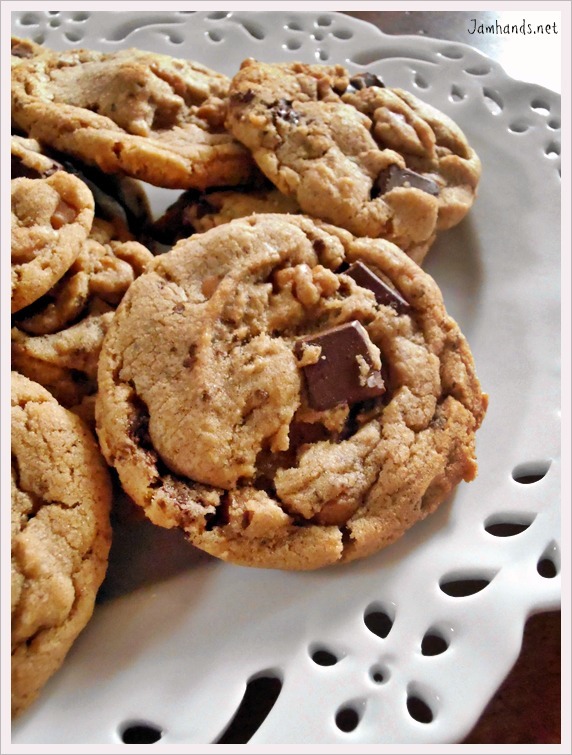 Today I am bringing a cookie recipe, courtesy of the famous and incredible blog, Kevin & Amanda. It incorporates flavors of chocolate, sea salt, caramel and coffee, which all happen to be flavors I love. Many thanks to Kevin & Amanda for this recipe. It is a new favorite at our house, especially by my four year old who claims to love coffee and all spicy foods. I think he is going to be quite an adventurous eater when he grows up. Enjoy! 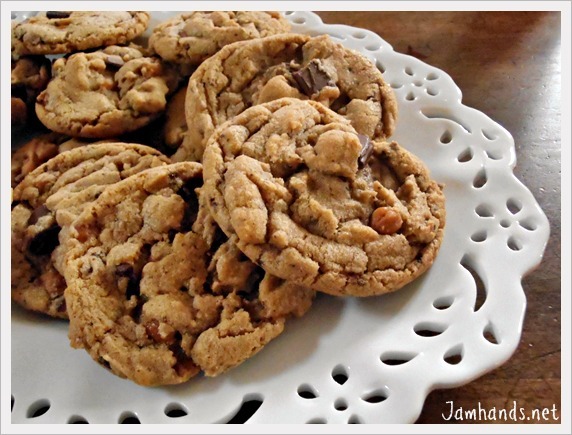 - I used half the amount of instant coffee as I knew my kids might sneak a few cookies. It still had a great flavor even with half, and you could omit entirely if you prefer. - I would increase the amount of caramel bits to 1 1/2 cups for a bit more caramel goodness. My cookies, compared to the photographs at the original site, seem to have a lot less caramel bits in each cookie. - I skipped the sea salt sprinkle at the end only because my sea salt has gone missing. I bet it would've been a nice touch and I intend to try it out next time I make these. 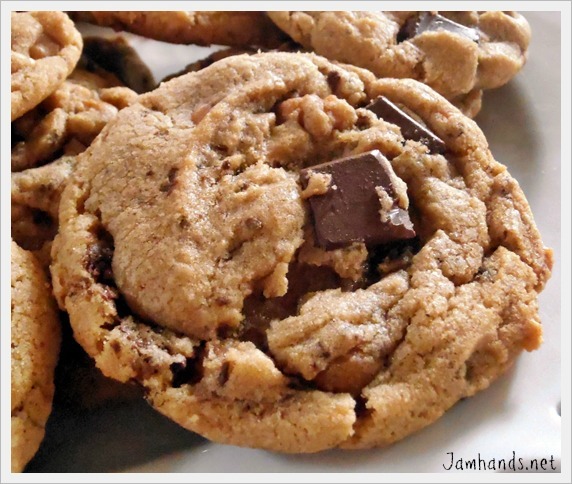 - These cookies are best eaten in the first 2 days. After that they are good but not nearly as great. 1. Preheat the oven to 350 degrees F. Melt the butter in a saucepan over medium heat. Once the butter starts to foam, begin whisking constantly. When the butter turns brown, fragrant, and you see little brown bits at the bottom of the pan, immediately remove from heat and and transfer to a large mixing bowl. Set aside to cool. 2. Meanwhile, whisk together the flour, coffee, baking soda, and salt in a bowl and set aside. 3. With an electric mixer, beat the butter and sugars until well combined, about 3-5 minutes. Add the egg, yolk, and vanilla until well combined. Add the dry ingredients and mix on low-speed just until combined. Add the caramels and chocolate chunks and stir until just combined. 4. 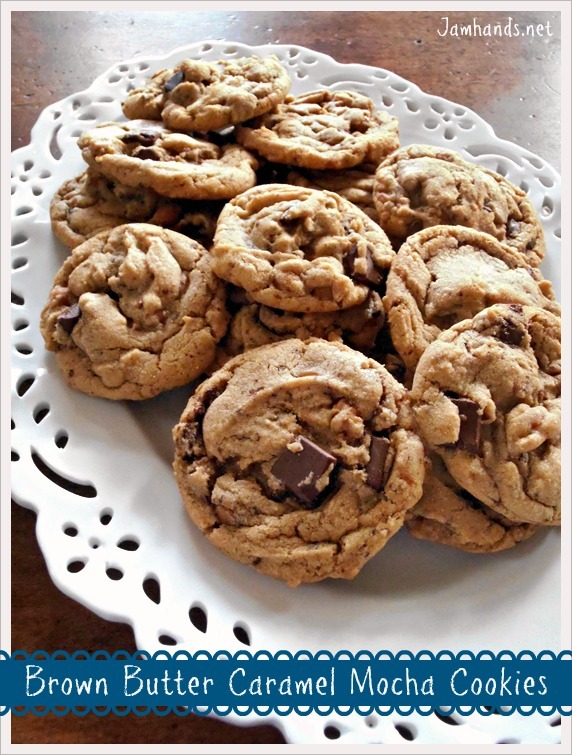 Use a medium (1.5 tbsp) cookie scoop to place dough on a cookie sheet lined with parchment paper. Bake at 350 for 10 minutes until edges just start to turn golden brown. Sprinkle with sea salt. Cool on a wire rack. I just recently discovered your blog and it's AMAZING! I can't stop clicking! I'll thank you in advance for the extra pounds that I am sure to gain if I make everything that looks so good here!